"Empire" star Jussie Smollett's bail was set at $100,000 Thursday, hours after the actor turned himself in to police on a felony charge of disorderly conduct in filing a false police report. Police said in a press conference hours later that Smollett sent a "false letter that relied on racial, homophobic and political language" to himself and staged a hate crime attack in Chicago because he was "dissatisfied with his salary." "This announcement today recognizes that 'Empire' actor Jussie Smolett took advantage of the pain and anger of racism to promote his career. 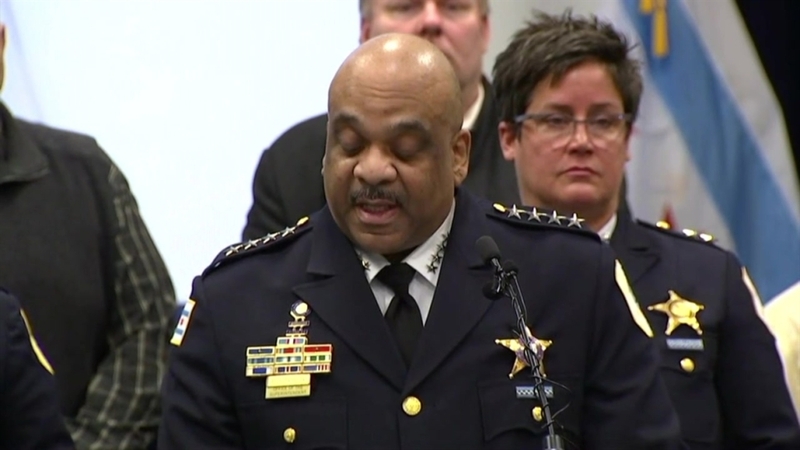 I'm left hanging my head and asking why," Chicago Police Supt. Eddie Johnson said. Chicago police spokesman Anthony Guglielmi confirmed to NBC Chicago that Smollett surrendered to police at around 5 a.m. at CPD's Central Booking station at West 18th Street and South State Street. "Detectives will make contact with his legal team to negotiate a reasonable surrender for his arrest," Guglielmi had said in an earlier statement on Wednesday. Chicago Police Supt. Eddie Johnson was scheduled to address the case at 9 a.m. from CPD headquarters. Smollett was expected to appear in bond court at 1:30 p.m. Thursday afternoon. Chicago police have confirmed that attorneys for Smollett had discussions with prosecutors, but details surrounding the dialogue were not released and Guglielmi declined to confirm reports that subpoenas had been issued for Smollett's phone and bank records. Police said earlier this week that they wanted to re-interview Smollett in their investigation into an alleged attack he said he suffered in the city's Streeterville neighborhood three weeks prior. Authorities said new information "shifted" their investigation of the reported assault, in which Smollett told authorities he was physically attacked as he was returning home from an early morning stop at a Subway restaurant. He said two masked men shouted racial, anti-gay slurs and "This is MAGA country!" as they looped a rope around his neck and poured an "unknown chemical substance" on him before running away. Detectives questioned two brothers about the attack but released them late Friday without charges, Guglielmi said Saturday. Police said they had gleaned new information from their interrogation of the two men and they were no longer suspects. Surveillance video taken at 10 a.m. on Jan. 28 appears to show brothers Abel and Ola Osundairo shopping at Beauty House at 1041 W. Wilson Ave. in the Uptown neighborhood. The brothers can be seen making their way to the check out counter and purchasing several items, including two ski masks, gloves and baseball caps. The video then shows them walking to their vehicle. The items are of interest because police said Smollett told them the attackers were wearing masks. The security guard working that day told NBC 5 he realized the brothers had been in the store last week and that he had helped them find the items they were looking for. “I know it’s them. I showed them the mask, we have them on video purchasing the mask. So there’s no doubt in my mind," Montage Silas said. The brothers were interviewed, arrested and later released without charges in connection to the alleged attack. Chicago police then said the brothers were being considered cooperating witnesses against Smollett. "This has been very traumatizing for them as well as everyone who knows this story and has heard this story," said Gloria Schmidt, attorney for the Osundairo brothers. On Tuesday, Cook County State's Attorney Kim Foxx recused herself from the investigation into the alleged attack with little explanation. A statement from 20th Century Fox Television and Fox Entertainment issued Wednesday - before the charges were announced - said that despite the ongoing case, Smollett's character was "not being written out of the show." "Jussie Smollett continues to be a consummate professional on set and as we have previously stated, he is not being written out of the show," Fox said of Smollett.